If a picture tells a thousand words, the Library of Congress is bringing 440,000 of them to Los Angeles with a free-wheeling photo exhibition that seeks to define America’s zeitgeist in a way people have never seen. “Not An Ostrich: And Other Images From America’s Library,” which opened Saturday at the Annenberg Space For Photography, takes visitors on a picturesque journey across the country beginning with the birth of photography and continuing to the present day. But don’t expect just amber waves of grain and purple mountain majesties, although there are a few of those included in the 440 photographs. Instead, look for civil rights icon Rosa Parks sitting not in the back of the bus but in the front passenger seat in 1956 after the yearlong battle that she, Martin Luther King Jr. and others led to end segregation on public transportation succeeded. See baseball immortal Babe Ruth lying in his coffin in 1948, while not far away, in a photo taken seven years later, a young Hank Aaron is seen speaking with a reporter decades before he would break Ruth’s home-run record. Other photos show how day-to-day American life has evolved from the 19th century, when horse-drawn wagons hauled ice to homes, to 2005 when thousands lined up outside a Mojave Desert airplane hangar to see the launch of the X-Box 360 game. 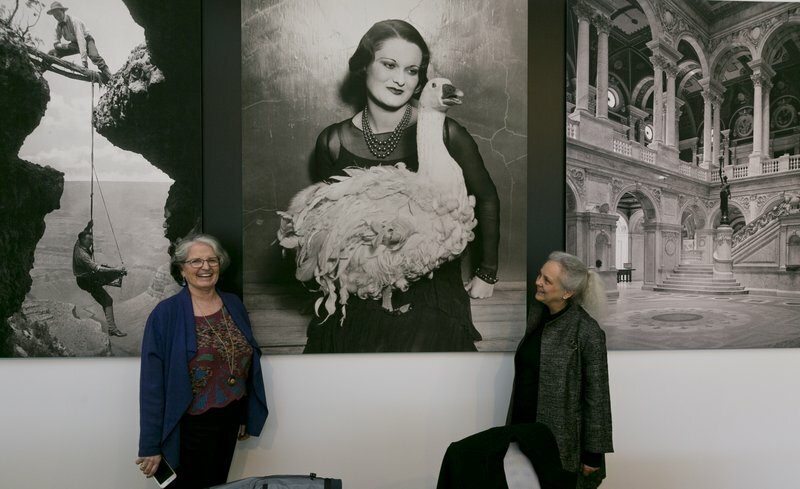 “I’ll be disappointed if somebody can come into this space and not find at least one picture that they love,” exhibition curator Anne Wilkes Tucker said during a recent pre-opening tour. Tucker worked for nearly two years with Library of Congress photo curator Beverly Brannan and others, culling through an estimated 1 million of the library’s 14 million photos. Some of the selections are laugh-out-loud funny as in a man holding a sign on a frigid Wisconsin winter day in 2001 asking, “What? You Couldn’t Have Pulled This Crap In Warm Weather,” as he and others protest Gov. Scott Walker’s efforts to roll back union bargaining rights. Others are menacing, like the image of a 1920s-era Ku Klux Klan rally two miles from Washington, D.C., that includes a Klan member glaring at the photographer. There’s also that reliable photo standby, the funny cat picture. This one, taken in 1936, features an annoyed-looking feline dressed to resemble the female warrior Brunhilde. “Around the turn of the century, in the early 19-somethings, people liked to make pictures of cats and dogs, putting them at tea tables with dolls, putting clothes on them,” said Brannan, revealing that at least one aspect of photography hasn’t changed much in 150 years. Nor has another: One of the first photos visitors see is a daguerreotype Robert Cornelius snapped of himself outside his family’s Philadelphia lamp shop in 1839. “The first selfie we’re calling it,” Librarian of Congress Carla Hayden said with a chuckle. It is included on the exhibition’s “Icons Wall.” Two others on the wall, placed side-by-side, are the first known photo of Abraham Lincoln, taken years before his assassination, and the first of legendary abolitionist Harriet Tubman, taken in 1868. A rebroadcast of race horse Seabiscuit’s stunning upset of War Admiral at Baltimore’s Pimlico Race Course in 1938 can also be heard as visitors gaze at a photo of the thoroughbred crossing the finish line four lengths ahead. Alexander Graham Bell has the distinction of being featured in more than one gallery, as he flies a kite in the leisure section and uses his invention, the telephone, to make one of the first long-distance calls in another. Celebrities are represented but not in the type of photos one might expect. There’s a candid family shot of Elizabeth Taylor, for example, showing her stretched across her bed in 1957 with her infant children as her husband Mike Todd leans over them. She was said to have liked it so much that she sent copies to friends at Christmas. Not far away is “Migrant Mother,” Dorothea Lange’s moving portrait of a destitute farmworker photographed in 1936 at a pea-pickers camp near Nipomo, California. Still others show photographers themselves at work, including a stunning image of Margaret Bourke White perched precariously on a gargoyle sculpture outside the 61st floor of New York’s Chrysler building in 1930 as she shoots the skyline below. In still another, a smiling Malcolm X is photographing a smiling Muhammad Ali. The exhibition, which is free, runs until Sept. 9.